Venue: Kanoria Arts Centre, Ahmedabad, Gujarat. 23rd November at 1.30 pm at IGNCA, Janpath. Open to all. And a tale of the Partition of the Indian Subcontinent in 1947, Dastan-e-Taqseem-Hind, which brings to the fore the absurdity and the tragedy of this cataclysmic event. The Partition tale will be performed for the first time since its inception six years back at the Prithvi Theatre. This dastangoi presentation is a story on Kabir, the 15th century poet. the story takes the audience on a journey in search of finding the Kabir who is within us. Dastan-e-Chouboli is a Rajasthani folk tale adapted by Vijay Dan Detha and subsequently adapted by Mahmood Farooqui for a Dastanic telling. The story is about a Rajasthani princess who has vowed to marry the person who makes her speak four times in a single night. A chauvinist Thakur takes up the challenge but fails like the 17 times 20 princes before him. Finally, it is left to Thakur's newly wedded wife to rescue everyone from this mess. Performed by Nadeem Shah & Manu Sikander Dhingra. Duration: 80 min with 10 minutes interval in between. Entry open to all, voluntary contributions welcomed. This dastan is a special story around the incarceration and trial of Binayak Sen.
and Amar Ayyaar (the chief of tricksters) explores ways to break through the spell. Afrasiyab, the Emperor of sorcerers and of the TIlism-e Hoshruba sends an ambassador, Qirtas Jadoo to his neighbour Emperor Kaukab Roshan Zameer, the ruler of TIlism-e Noor Afsha where his arch enemy Amar Aiyyar has taken shelter. Qirtas takes off with great fanfare traversing wondrous regions of the Tilism. Amar's disciples, the Aiyyars shadow him but he is too powerful a sorcerer to be easily fooled. On the way Qirtas captures Bahar, the powerful sorceress and the object of Afrasiyab's desires. The Aiyyars free her but Qirtas has now crossed over to the neighboring Tilism. Will he manage to kill Amar, will Aiyyars kill him before that and save their reputation? Poonam Girdhani & Namita Singhai. Also available at the Programmes Desk for Rs.350, Rs.250 & Rs.100. Stein Auditorium, India Habitat Centre. there will be a Dastangoi presentation on the cultural evening of the closing day. The dastan takes you on a journey in search of finding the Kabir who is within us. The programme will start with Ankit Chadha giving an introduction to Dastangoi, along with an insight into its history and demonstration of the form. 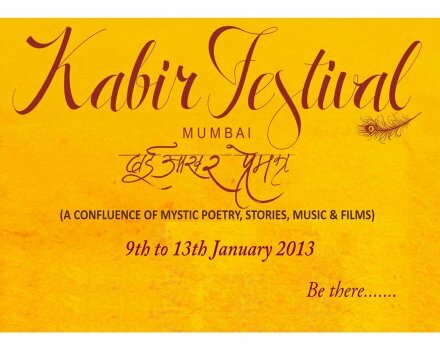 The main section of the event is the performance of Dastan Dhaai Aakhar Kee - a story on Kabir - the poet and the lover. Composed and performed by Ankit Chadha under the direction of Mahmood Farooqui, the story takes you on a journey about finding the Kabir who is around you, in you. as space is limited to 70 people. at the Main Sports Ground, GGS Indraprastha University, Dwarka, Sector 16C, Delhi 110078.